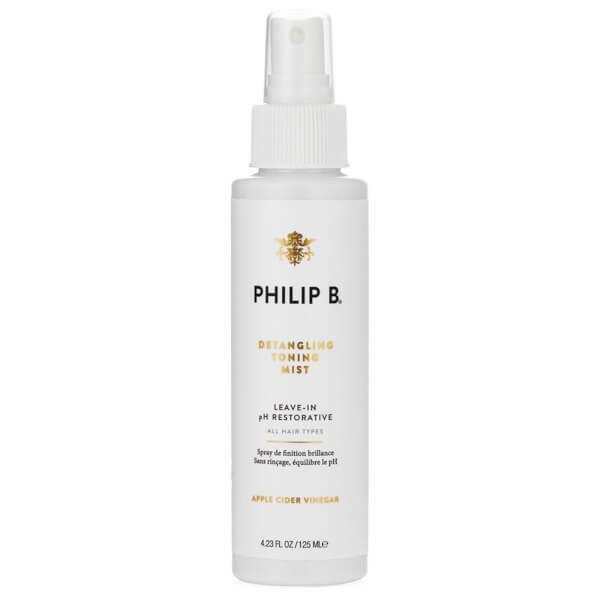 Philip B pH Restorative Detangling Toning Mist is a detangling, leave-in toner for the hair. This super-lightweight toner adjusts the pH of tap water allowing the cuticle of the hair to seal tightly, leaving smooth, detangled, shiny, gorgeous toned hair. Shake well. After shampooing and conditioning your hair, lightly spray through the mid-shaft and ends. Squeeze into your hair, towel dry and style as usual. Water/Aqua, Acetic Acid (Apple Cider Vinegar), Amodimethicone, SD Alcohol 40-B/Alcohol Denat, Polysorbate-20, Cetrimonium Chloride, Trideceth-12, Trimethylsiloxyamodimethicone, C11-15 Pareth-7, C12-16 Parethe-9, Glycerin, Olea Europaea (Olive) Fruit Oil, Sesamum Indicum (Sesame) Seed Oil, Arachis Hypogaea (Peanut) Oil, Prunus Amygdalus Dulcis (Sweet Almond) Oil, Simmondsia Chinensis (Jojoba) Seed Oil, Juglans Regia (Walnut) Seed Oil, BHT, Cananga Odorata Flower Oil, Lavandula Angustifolia (Lavender) Oil, Gardenia Florida Oil, Geranium Maculatum Oil, Chlorphensin, Linalool..